Peru has a lucrative mining industry in which gold, iron ore, coal, and phosphate rock are extracted and exported in substantial quantities. Petroleum is produced along the northern coast and in the Amazon basin, and there is a large refinery at Talara. Peru's other principal industries include food processing and manufacturing of steel and other metals, textiles, and clothing. There is also a substantial tourism industry. Peru’s principal exports are copper, gold, zinc, petroleum, coffee, potatoes, asparagus, and textiles. The principal imports are petroleum products, plastics, machinery, vehicles, iron and steel, wheat, and paper. The table below reflects the most recent economic data published by The Economist. Overall, the Peruvian economy is robust and growing. 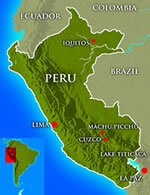 Peru experienced a 7.5% growth in GDP during 2006. Inflation for the year decreased to 1.1%, reflecting the healthy economic situation of the country. The value of Peru’s total exports increased by 23% to US$23.8 billion, of which US$ 14.7 billion (62%) was contributed by the mining sector. The value of imports increased by 14%, to US$14.87 billion. Peru’s net international reserves at the end of 2006 reached US$$17.27 billion, a figure 16% higher than that of 2005.